An ankle sprain is a stretching or tearing of ligaments around the joint – a membranous fold that supports bones or cartilages or holds together a joint. The most common location for a sprain is in your ankle. Sprains and strains of ankle are one of the most common sports injuries. The talus (foot bone) and the ends of 2 of the lower leg bones (tibia and fibula) form the ankle joint. This joint is supported by several lateral ligaments and medial ligaments. Most ankle sprains happen when the foot turns inward as a person falls, runs, turns or lands on the ankle joint after a jump. This type of sprain is called an inversion injury. It can lead to overstretching or tear of the ligament supporting ankle joint. Limited ability to move and use of ankle joint and these signs and symptoms can vary, depending on the severity or extent of the sprain. Sometimes people feel a pop or tear when the injury happens. A 1st degree sprains: involves no gross damage to collagen fibers, and, therefore, no laxity. A 2nd degree sprain is a partial tear, with some degree of laxity, but without discontinuity of the ligament. A 3rd degree sprain is a complete tear, with abnormal joint laxity, and no discernible end-point to this laxity. An ankle strain is a stretching or tearing of muscle or tendon around the joint. A tendon is a fibrous cord of tissue that connects muscles to bones. An ankle strain is caused by twisting or pulling a muscle or tendon, recent injury or trauma; it also can occur after improperly lifting heavy objects or overstressing the muscles, prolonged and repetitive movement of the muscles and tendons. Patients typically have pain in the injured area and the general weakness of the muscle when they attempt to move it. Severe strains that partially or completely tear the muscle or tendon are often very painful and disabling. An ankle strain is caused by pulling or twisting a muscle or tendon around the joint. Ankle strains are classified into 2 types; acute and chronic. Acute ankle strain is caused by injury or trauma such as a blow to the body; it can also be due to over-stressing the muscles or improperly lifting heavy objects. Chronic ankle strains are usually the result of overuse – prolonged, repetitive movement of the muscles and tendons. Treatment for ankle sprains and strains is similar and can be thought of as having 2 stages. The goal first stage of treatment is to reduce pain and swelling. 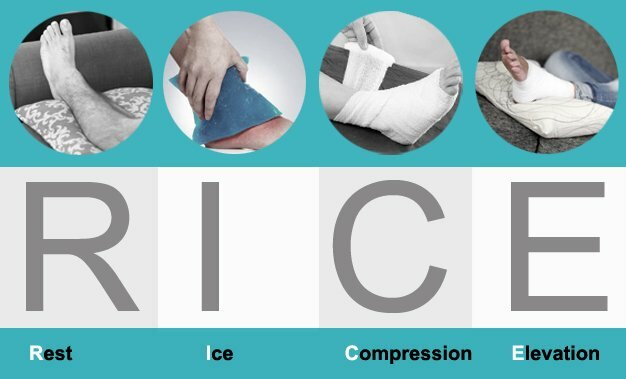 At this stage, doctors usually advise patients to follow a formula of R.I.C.E rest, ice, compression, and elevation for the first 24 to 48 hours after the injury. Rest: Advised for 48 hours after injury. Ice: Advice the use of an ice pack that can be molded to fit the joint (a bag of frozen peas works well, but if ice cubes are used they should be placed in a plastic bag to avoid ice burns to the skin) for a minimum of 10 min and up to 30 min. Compression: Bandages are often used; Compression of an injured ankle may help reduce swelling. Examples of compression bandages are elastic wraps and splints. Elevation: The affected limb helps to minimize the swelling. Resting swollen ankle at or above hip level as much as possible will help. For people with a moderate or severe sprain, particularly of the ankle, a hard cast may be applied. Severe ankle sprains and strains may require surgery to repair the torn ligaments, muscle, or tendons. Usually, an orthopedic surgeon performs the surgery. It is essential that moderate and severe ankle sprains and strains be examined by a doctor to allow prompt, appropriate treatment to begin. The information above lists some signs that should alert people to consult their doctor. However, an individual who has any concerns about the seriousness of an ankle sprain or strain should always contact an experienced orthopedic specialist for advice. The second stage of treatment of a sprain or strain is rehabilitation, whose overall objective is to improve the condition of the injured party and restore its function. The doctor will prescribe an exercise program designed to prevent stiffness, improve range of motion and flexibility and regain the proper strength of the joint. Some patients may need physiotherapy during this stage. When the acute swelling and pain have diminished, your physiotherapist will teach the patient to do a set of exercises several times a day. These are crucial because they help reduce swelling, prevent stiffness, and restore normal, pain-free range of motion of ankle joint. Your physiotherapist will recommend many different types of exercises, depending on the injury. Another goal of rehabilitation is to increase strength and regain flexibility of ankle joint. Depending on the patient’s rate of recovery, this process begins about the 2nd week after the injury. A physical therapist will instruct the patient to do a set of exercises designed to meet these goals. During this period of rehabilitation, patients progress to more demanding exercises as pain decreases and function improves. How to prevent ankle sprains and strains? Practice safety measures to help prevent falls (for example, keep stairways, walkways, yards). Sprains and Strains ankle injury, ankle pain, ankle sprain, inflammation, muscle pain, muscle spasm, muscle sprain, pain, sprain, sprains and strains, strain, strained ankle. permalink.